香港天文台所示之最接近距離 (如適用) Not available - CPA occurred after cancellation of TC signals. 香港天文台所示之最接近時間 (如適用) Not available - CPA occurred after cancellation of TC signals. MEGI is the first super typhoon (at maximum strength) to necessitate tropical cyclone signals since the implementation of the new tropical cyclone classification system in 2009. It is also the first storm in this basin in almost 20 years to have a measured minimum pressure of less than 900 hPa. A tropical disturbance persisted near Guam on October 11. The disturbance acquired spiraling characteristics and a well-defined low-level circulation on October 12, and a tropical cyclone formation alert was promptly issued by the JTWC. 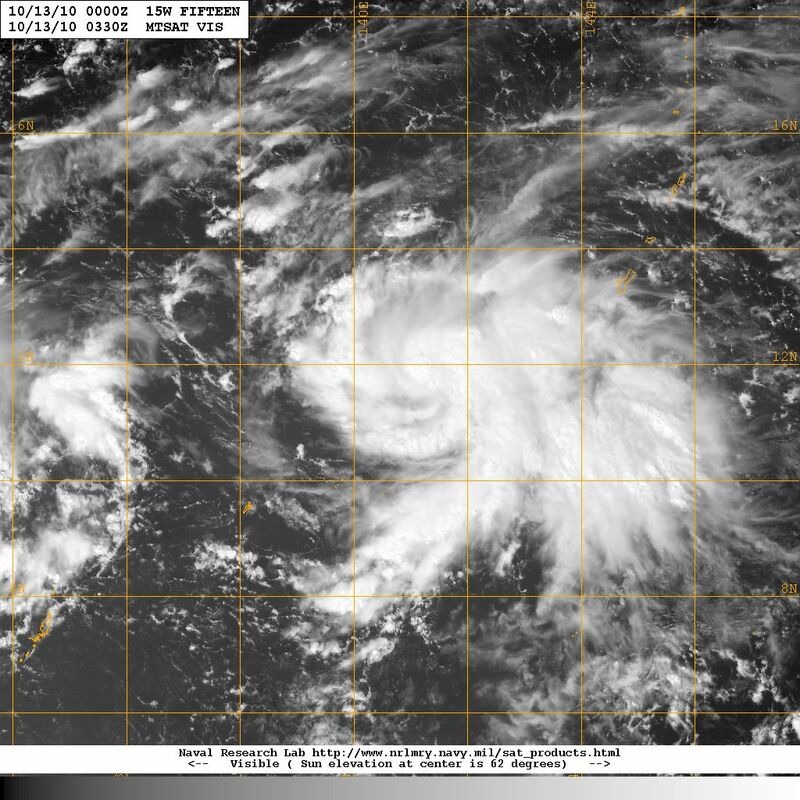 It strengthened into the fifteenth tropical depression in this basin in the morning of October 13. At that time, model forecasts had been consistently predicting a fierce intensification leading to a very intense system by the next week, and ECMWF was at that time forecasting an intense typhoon inside the South China Sea a week later. Since the storm was expected to move west with a large body of warm ocean ahead, the JTWC also predicted a continual intensification. Model guidance was not in good agreement. At that time the subtropical ridge was E-W oriented and anchored north of 15W. All model expected a weakness to appear due to a passing trough, but they disagree on whether or not 15W will be captured into the weakness and recurve. ECMWF had been very consistent, predicting that the ridge would not be weakened that much and MEGI would not be north enough to induce a recurvature, while GFS and NOGAPS indicated recurvature at some point. 15W gathered strength quickly. The JMA upgraded it into a tropical storm at 20 HKT on October 13, naming it MEGI. This name was contributed by South Korea, meaning catfish. In the next 12 hours, MEGI's eastern semicircle expanded in size, while development in its western side was limited, probably due to a disturbance persisting to the southwest of MEGI which impeded inflow channels. MEGI adopted a WNW track along the southern periphery of the subtropical ridge, with northward component coming from the southward extension of the ridge to MEGI's east. 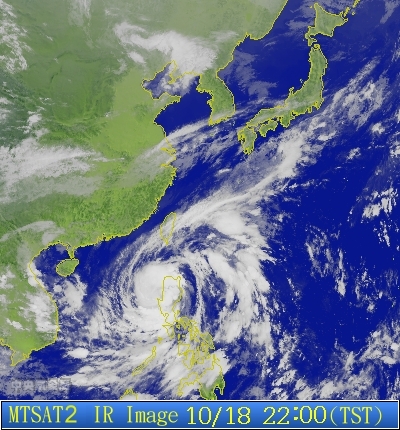 The JMA upgraded MEGI into a severe tropical storm on October 15 as convection expanded outward. By that time the disturbance affecting MEGI was dissipating. 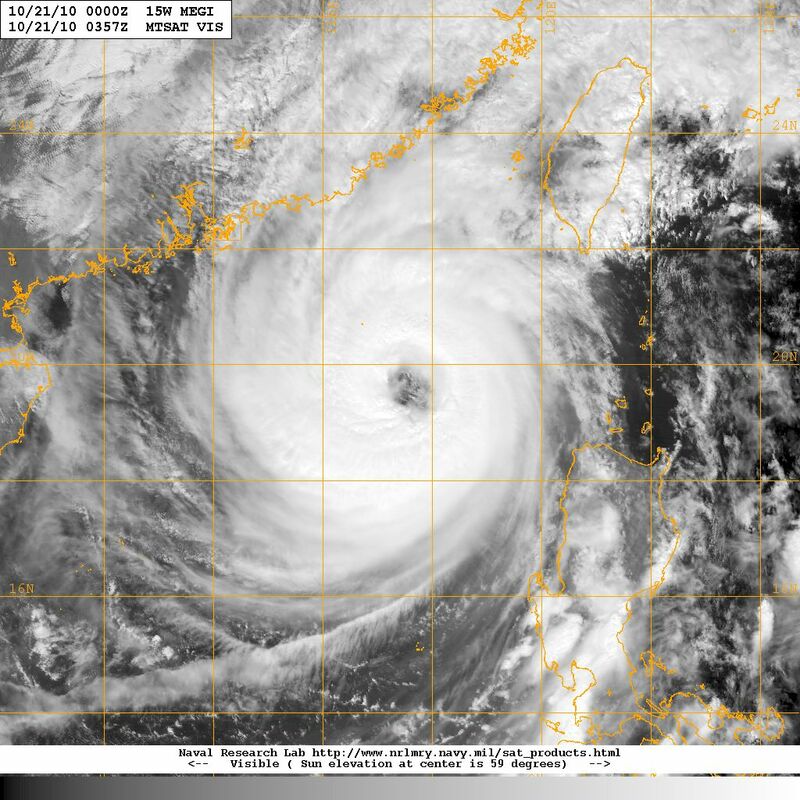 Although still not quite symmetric in shape, it intensified into a typhoon later that day. Difference in strength estimation was wide between the JTWC and JMA, with the former estimating MEGI to have maximum winds of 90 knots when the JMA upgraded MEGI into a typhoon (65 knots) (this difference is still large after accounting for the fact that the JTWC uses 1-minute average wind speeds while JMA uses 10-minute average). At that time, the subtropical ridge was getting thinner as it interacted with the trough, but it remained intact. Nevertheless, the weakening of the ridge allowed more room for poleward track component and MEGI moved northwest on October 15 as a result. As it neared the southern edge of the ridge, it gradually turned westward. MEGI intensified steadily on October 16 while still going westward. The central dense overcast was developing quickly, but peripheral convections remained asymmetric. 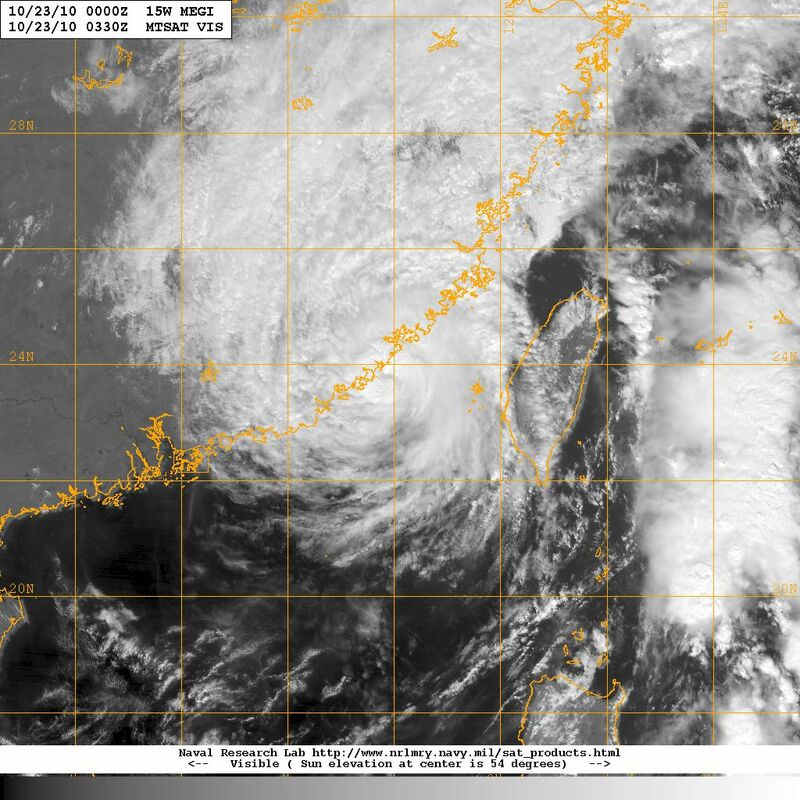 It intensified into an 80-knot (JMA) / 105-knot (JTWC) system by 20 HKT that night. 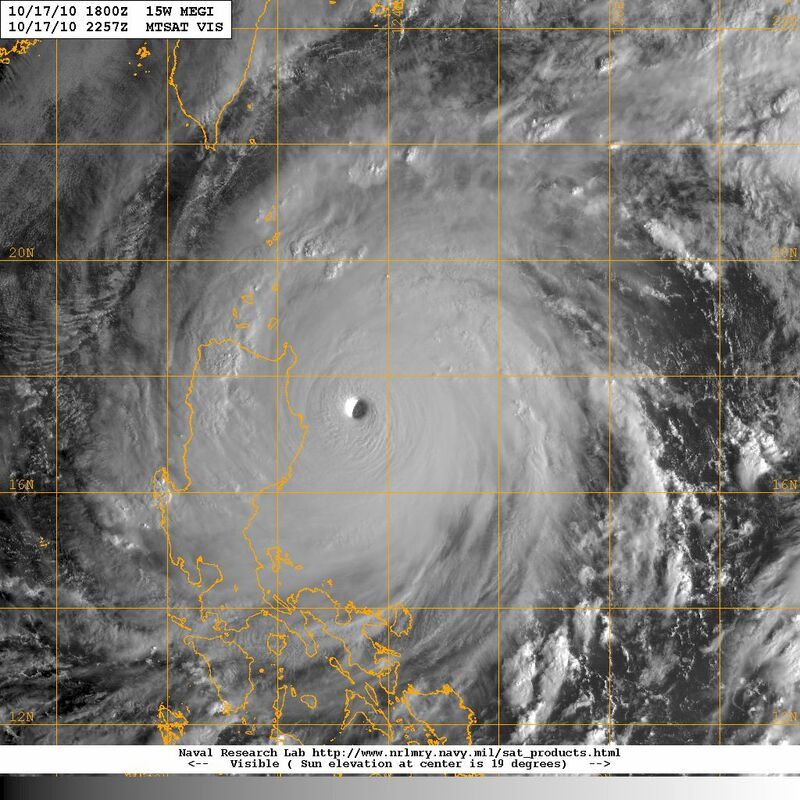 In the next 12 hours, MEGI deepened rapidly, and a clear eye appeared on IR satellite images. 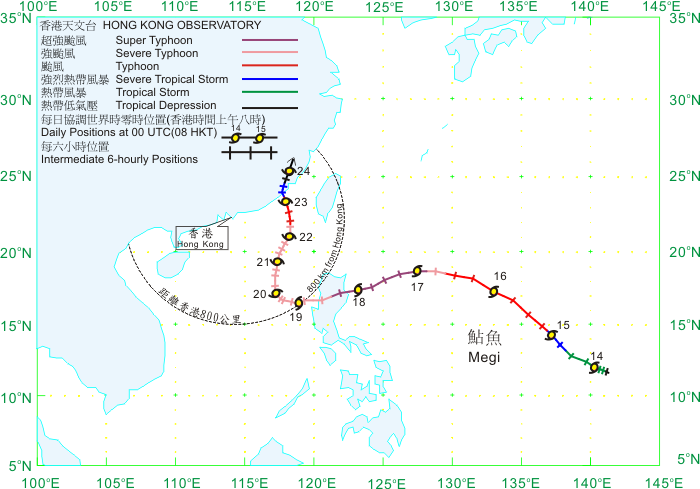 The HKO upgraded MEGI into a severe typhoon at 22 HKT on October 16 and then a super typhoon at 06 HKT on October 17. The JMA revised MEGI's intensity upwards to 90 knots at 02 HKT on October 17, and 110 knots at 08 HKT that day. Meanwhile, JTWC's estimate surged to 125 knots and 140 knots (category 5 super typhoon) at 02 HKT and 08 HKT respectively. An aircraft reconnaissance mission on MEGI was carried at about 08 - 09 HKT on October 17. The aircraft reported maximum flight level winds of 169 knots and estimated maximum surface winds of 143 knots. The minimum sea level pressure dropped to 909 hPa (Full decoded message here). 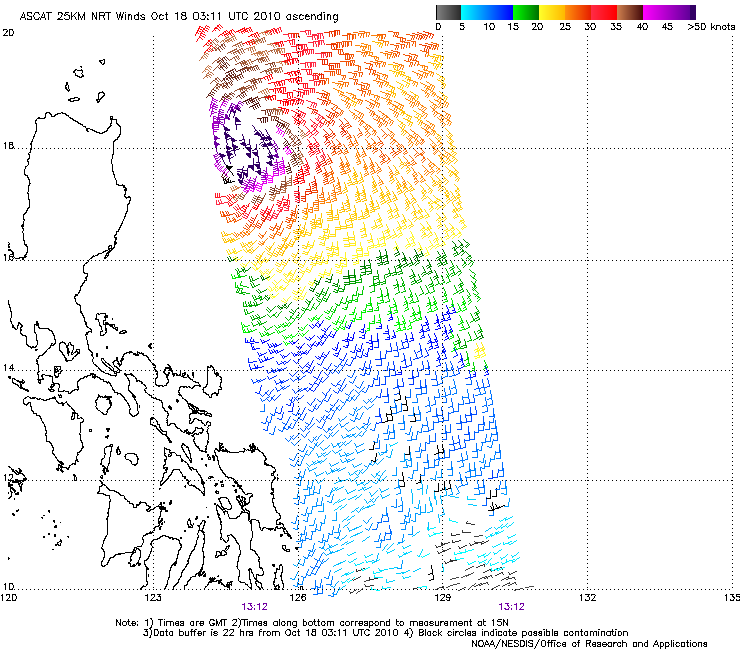 At that time, MEGI started to turn WSW as it started to be influenced by the continental ridge NW of it. In almost null shear environment MEGI continued to intensify during October 17. Its eye increased in size during the day and convections in its southern periphery expanded. The sea level pressure indicated in their bulletins were also revised to below 900 hPa, with the JMA assigning 895 hPa which was the lowest in almost two decades (again this is because no measured data could be captured for many strong cyclones since early 1990s). MEGI maintained its intensity in the next 12 hours as it approached northern Luzon. The JMA lowered their pressure estimate to 890 hPa at 02 HKT on October 18, then further to 885 hPa at 08 HKT with maximum winds of 125 knots. 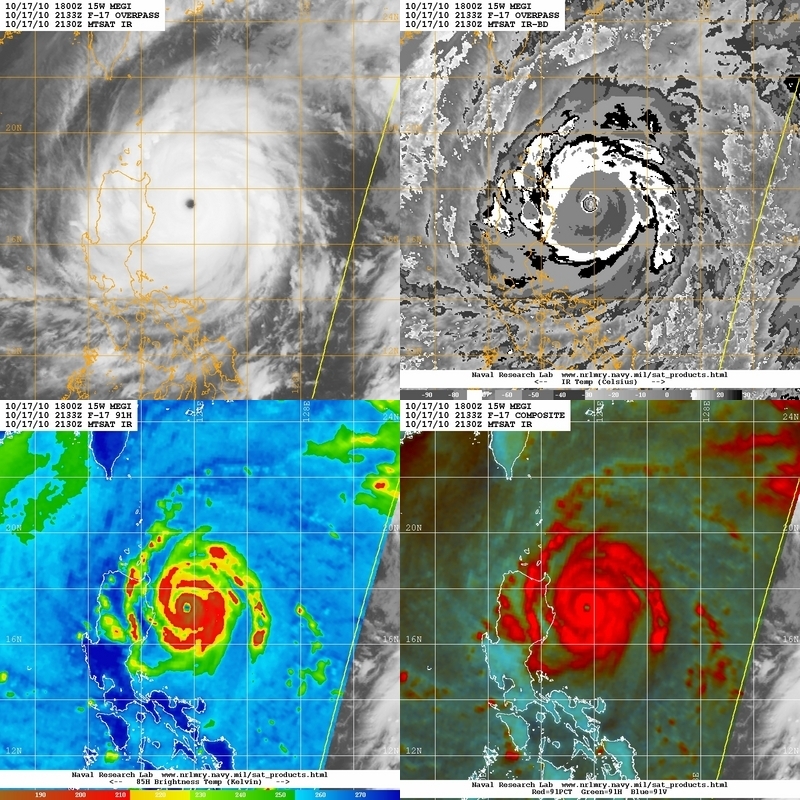 Figure 9 - Different images showing MEGI near peak intensity. 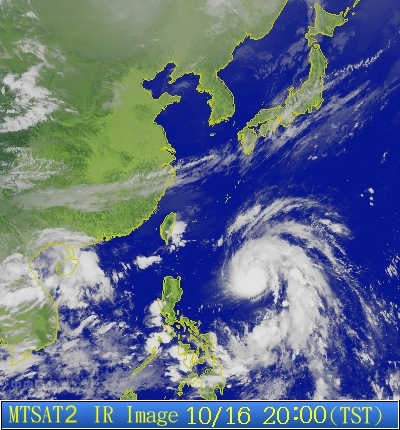 The Philippines braced itself for the strongest typhoon to hit the country in 4 years. Packing winds of category 5 strength, MEGI made landfall at Sierra Madre at about noon on October 18. The Storm signal #4, highest in the country, was issued in some parts of Luzon indicating that winds of above 185 km/h (100 knots) were to be expected. 19 people died in the country as a result of the storm, and damages amounted to 11 billion Philippine peso (about 2 billion HKD). 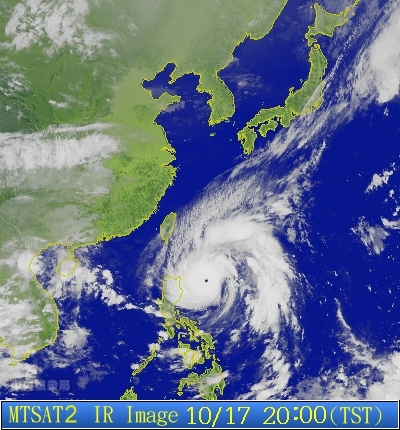 The clear eye disappeared about an hour after MEGI's landfall. The storm then traversed Luzon in the afternoon that day, and passed across the mountain ridge between Mount Sapocoy and Mount Pulog (both with summit above 2000 metres). As a result its lower structure was severely damaged. Deep convections were lost and MEGI's convections appeared looser than before, but it managed to retain (severe) typhoon strength. After a relatively fast journey across Luzon, MEGI turned west again and entered South China Sea before midnight, October 19. It started to decelerate during that night. 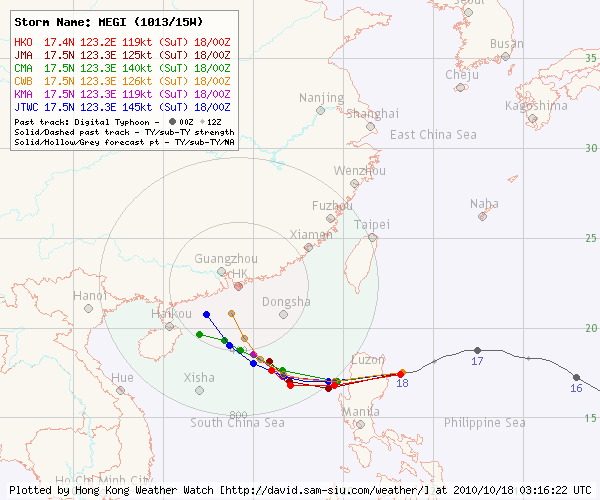 For the past few days, ECMWF consistently predicted that MEGI would continue its westward journey (or turn WNW) towards Hainan, and it would intensify again to super typhoon strength as it travelled in warm seas. 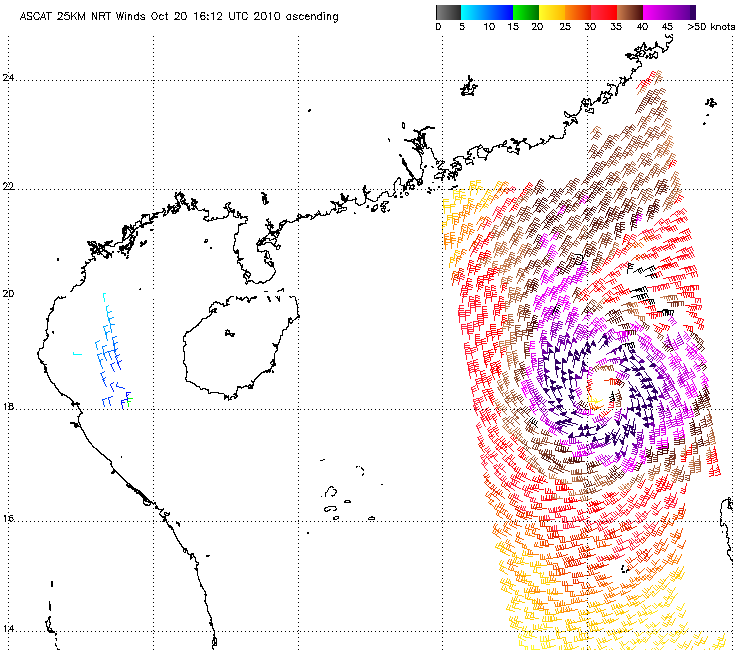 Probably as a result of this, agencies had been predicting that MEGI would strike Hainan Island. However, an increasing number of models pointed out in the possibility of the subtropical ridge weakening more heavily than originally predicted, and that the storm would turn north in South China Sea or even recurve. Therefore, agencies have started to retract their westward predictions and indicate a poleward turn since October 18. 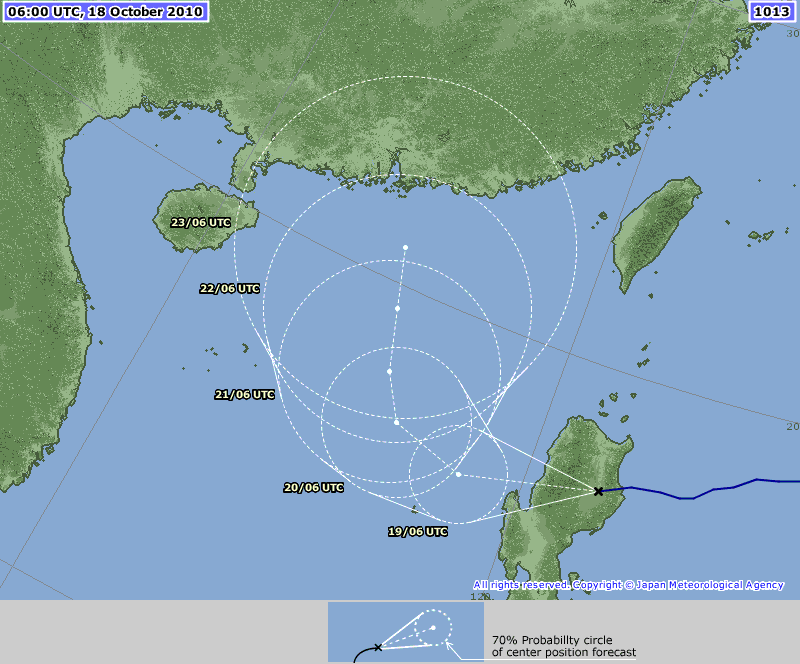 A eastward correction to their prediction meant that central and eastern Guangdong coastal areas (including Hong Kong) would be under a heightened threat, and due to the severity of the cyclone's destructive power, people in these regions and the media started to monitor the situation closely as soon as MEGI entered South China Sea. MEGI strengthened again soon after re-entering ocean. 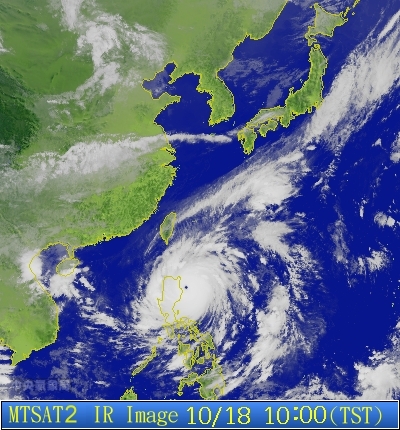 It entered Hong Kong's 800-km circle in the morning of October 19. 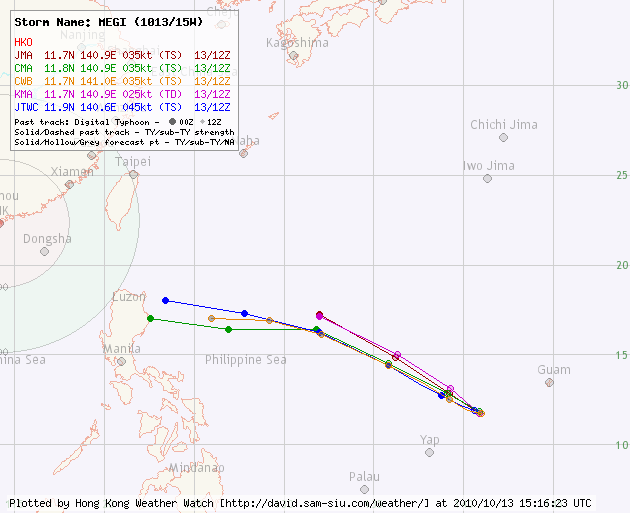 At that time a number of agencies including the HKO predicted MEGI to turn NW or NNW a day later, with the possibility of landfall in the vicinity of Hong Kong later that week. As the HKO emphasized that MEGI was a severe typhoon packing winds of 175 km/h (95 knots), heightened alert could be seen over the territories. Media coverage on MEGI was immense, and major TV stations in Hong Kong reviewed past super typhoons that brought significant damage to Hong Kong. 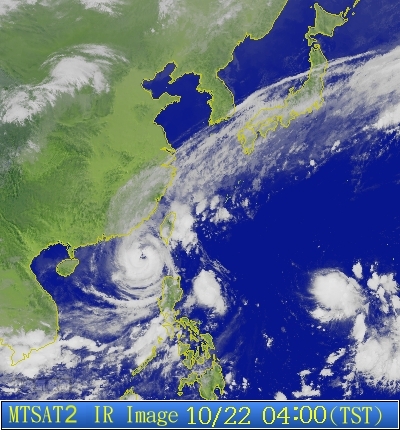 MEGI stopped moving west in the morning of October 20. The continental ridge was eroded away by a series of mid-latitude troughs and that the subtropical ridge to the east of MEGI became N-S oriented. 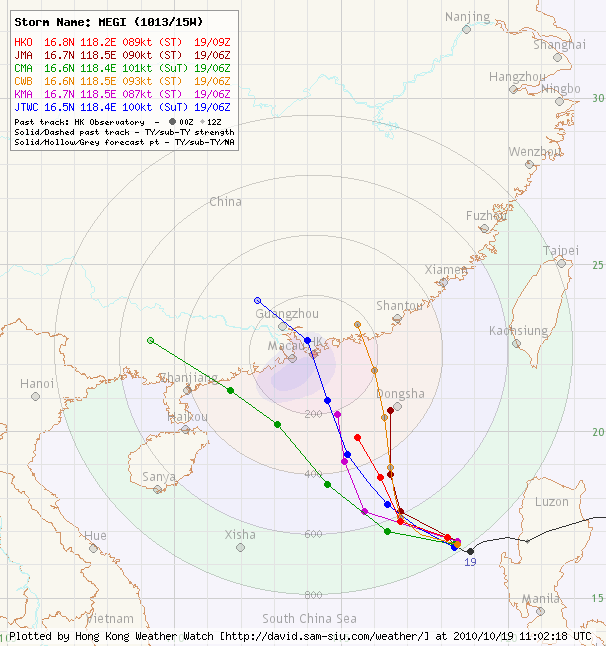 Agencies shifted their forecast tracks further east, indicating landfall from just east of Hong Kong to southern Fujian. 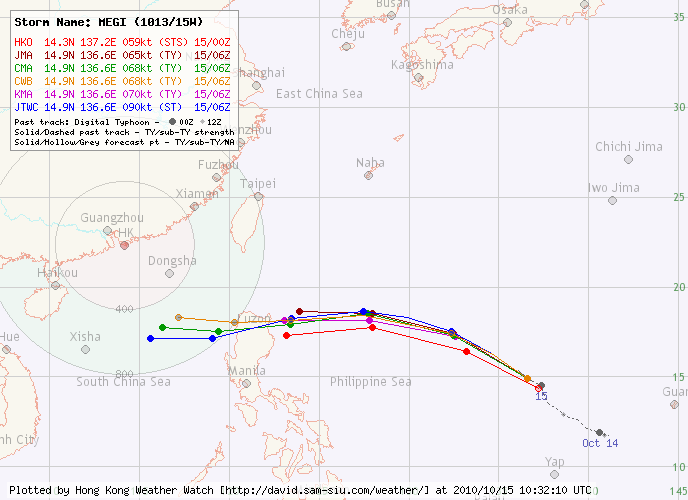 Due to the sudden northward turn, MEGI would get soon get closer, and the Hong Kong Observatory issued the #1 Standby Signal at 16:35 HKT when MEGI was 570 km SSE of Hong Kong. 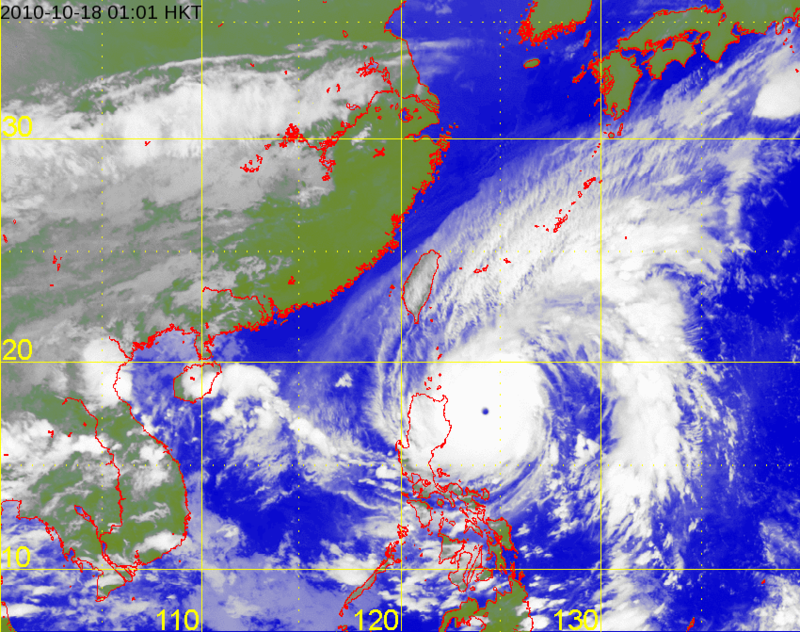 Coupled with the northeast monsoon, northerly winds in Hong Kong strengthened that night, occasionally reaching strong force in offshore areas and on high grounds. The Observatory initially stated that the chance of raising the alert to #3 that night was not high, but retracted the statement after a general increase in local winds that night. 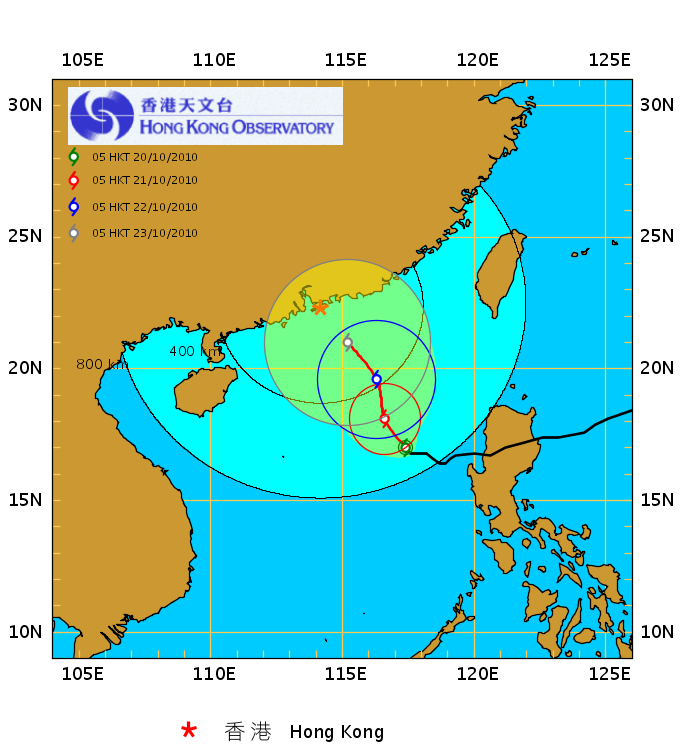 The HKO explained that it was due to the strengthening northeast monsoon, which was probably supported by the increasing barometric pressure (as opposed to decresing pressure if it was due to the cyclone moving closer). The Observatory finally issued the #3 Strong Wind Signal at 05:40 HKT on October 21, but winds actually subsided as the northeast monsoon moderated. MEGI's eastward track component increased significantly on October 21, and the storm remained outside of Hong Kong's 400-km circle. For most stations, the strongest winds were actually recorded the night before (October 20), and on October 21 winds were not particularly strong. Although MEGI remained strong (still 175 km/h or 95 knots) and was showing a ragged eye on satellite images, it was situated some 400 km SE of Hong Kong, and topographical features in Hong Kong prevented northerly winds from becoming stronger. Nevertheless, a government press conference was held that afternoon to introduce the various measures that the government would undertake if MEGI approached. Such a government press conference about an impending typhoon was almost nonexistent in the past. However, as MEGI was then edging closer to Taiwan than expected, the CWB issued the Land and Sea Typhoon Warning on October 21. As the southeasterly airstream from MEGI converged with the northeast monsoon, convection activity was violent on the Island and many locations on Taiwan recorded more than 400 mm of rain in three days from October 21 to 23. Rocks falling down from slopes hit a coach in Suhua highway, presumably sending the coach and all 21 people inside, comprising a driver, a tour guide and 19 tourists from Zhuhai, down the cliff and into the Pacific Ocean. They remained missing as of early November. Back to Hong Kong, the Strong Wind Signal remained in force for the rest of October 21. As MEGI reached 20°N, cooler water rushing in from the Taiwan Strait entered its core, lowering the amount of energy that it could capture. MEGI shrank in size and its eye disappeared from IR images. 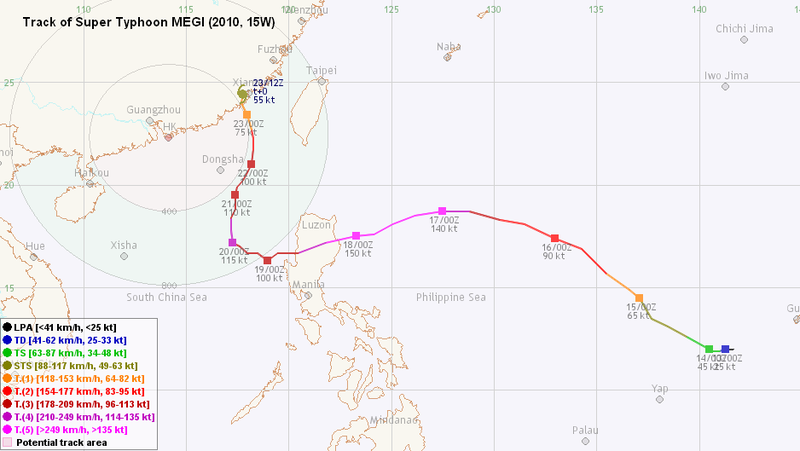 On October 22, MEGI acquire slight westward track component, as if it was tracking along Hong Kong's 400-km circle. Due to the apparent weakening of the storm, the HKO issued the #1 Standby Signal at 18:05 HKT that day, replacing the Strong Wind Signal. 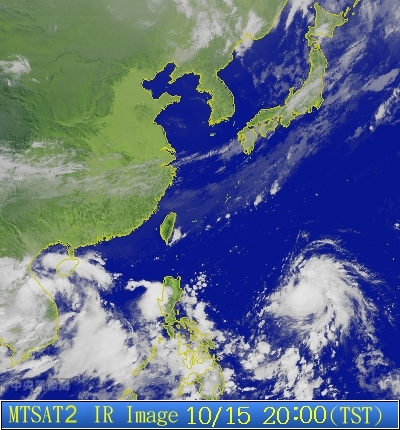 The Standby Signal was soon lifted at 20:40 HKT when MEGI reached Hong Kong's latitude. Wind direction gradually turned to northwest, which was also a shielded direction. 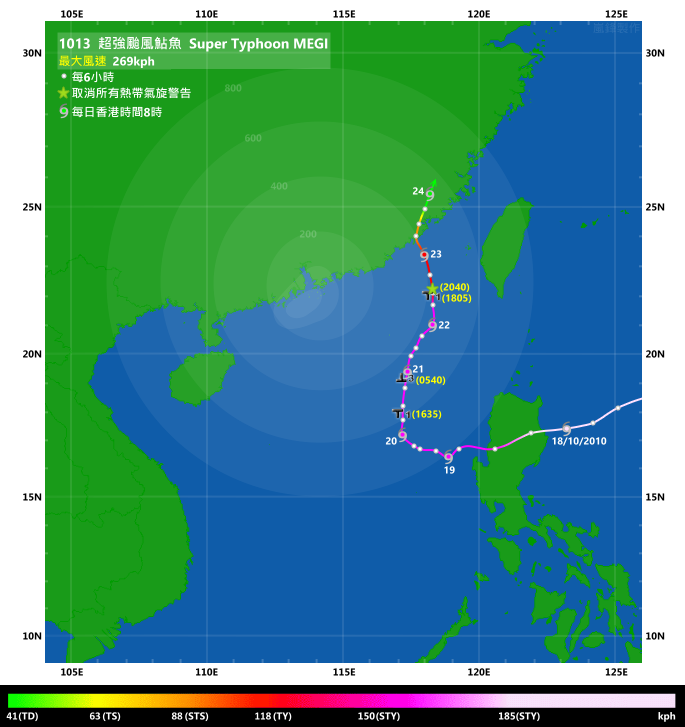 MEGI weakened into a minimal typhoon as it made its final landfall at Zhangpu, Fujian at about 13 HKT on October 23. 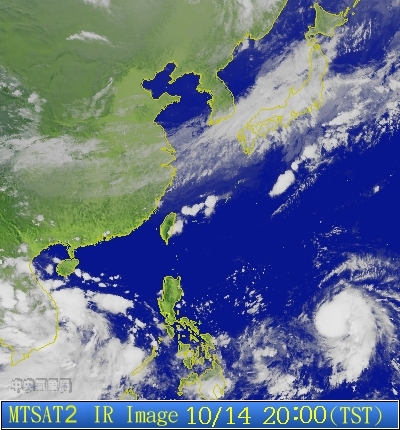 It is worth mentioning that MEGI is the third cyclone this year to make landfall at Zhangpu, after LIONROCK in early September and FANAPI later that month. Luckily, due to the effect of cooler water, the intensity at landfall was much weaker than originally predicted, which helped in reducing damages. The shrinking cyclone also provided better weather for Hong Kong than expected, as October 23 remained a fine day for the territory instead of frequent heavy downpours predicted earlier. Without moisture and being a small cyclone, MEGI weakened quickly upon landfall, dissipating in Fujian province in less than a day.